The inspiring true story of the world’s worst singer. 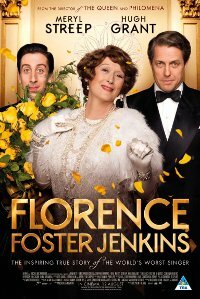 Set in the 1940s in New York, Florence Foster Jenkins is a a New York heiress and socialite, obsessively pursuing her dream of becoming a great singer. The voice she hears in her head is beautiful, but to everyone else it is hilariously awful. Her ’’husband’’ and manager, an aristocratic English actor, is determined to protect his beloved Florence from the truth. When she decides to give a public concert at Carnegie Hall, her husband knows he faces his greatest challenge.